Thanksgiving is only a few days away and the tension is building. People are getting nervous about traveling, creating the perfect feast or are simply frustrated with cranky people. Take a deep breath everyone. The holidays don’t have to be another reason to grumble. Here are some simple ways to enjoy your holiday and not feel trapped in the kitchen. The most important thing for surviving the holidays is knowing what to expect. Pick recipes you already know are good and that you’ve made before. If you really want to try something new, pick only one recipe. New recipes are so easy to mess up and no one wants to bring a dud to the table. Example: My office decided to throw a Christmas party and I wanted to try making homemade eggnog. The problem was the milk boiled and the whole thing curdled. I was stuck with chunky eggnog pudding. I didn’t have a pretty dish to put it in so I could pretend it was intentional. So, I brought in my pitcher of thick eggnog goo to the potluck. Needless to say, no one ate it and I haven’t tried to make eggnog since. We all know that the closer it is to the holidays, the worse the grocery store becomes. I know that if I want to stay in the holiday spirit, I have to avoid grumpy stressed people trying to run you over to get to the checkout lane. Take the time now to put together your grocery list and get to the store while it’s still relatively quiet. It also gives you plenty of time to grab any last minute forgotten items. Example: Last year I realized that I had forgotten to purchase the sweetened condensed milk I need to make my amazing pumpkin pie. Thankfully I realized this out early enough in the day and could make my own. It took a long time, but I was able to make my pumpkin pie without anyone realizing my mistake. So before you rush to the store, do a quick online search for possible substitutes. You might have something on hand you can use instead. You can make your pumpkin, apple, pecan or mincemeat pie several days ahead of time. Just bake them and keep them in the fridge until the big day. If you really want to plan ahead you can assemble your pie, not bake it and keep it in the freezer for several weeks. The day before your feast just pop it in the oven and give it plenty of time to cool. Most of your sides can be treated the same way. You can assemble, keep in the fridge and wait to bake or freeze and bake later. Example: I try to make as much as I can before Thanksgiving day. It’s nice to wake up in the morning and just have to pop things in the oven. I always make my spinach pie, cheesy potatoes, pies, stuffing and small breakfast casserole ahead of time. Look at your recipes a second time. Your green bean casserole can easily be put together the night before. Almost every Thanksgiving horror story I read involves cooks who have never made a turkey before or want to try a new method. If you want to try something new, whether it’s roasting, frying, brining or smoking you want to test it out first. Buy a frozen chicken and try the method you prefer. Practice before the big day instead of running the risk of ruining the star of the meal. – Thawing your turkey can take days. Make sure you have enough time. – When you’re estimating how much time you’ll need to roast, always double the time. I’ve never cooked an 8 lb. turkey in under 3 hours. You can always reheat the turkey, but you can’t serve it raw. – Measure your oven before buying your turkey to make sure it will fit. – Use a meat thermometer to avoid over or under cooking. – Make sure you remove the giblets before roasting. – Cook your stuffing outside of your turkey to avoid salmonella. – Let the meat rest 15-20 minutes before carving. – Keep animals out of the kitchen and away from the turkey! Example: The first time I made the turkey for Thanksgiving I decided to brine it. I used a five gallon bucket I had cleaned out and added ice periodically. I put something heavy on the lid to avoid any canine investigation and I roasted the turkey to perfection. I did however have to transport my bird to my mother’s house. I covered it with tin foil and left it in the roasting pan. I was afraid it would move too much on the floor, so I put it on the passenger seat and drove very carefully across town. The turkey did survive the trip, but my car seat did not. It had a stain from the turkey drippings until the day I sold it. The moral of the story: whoever cooks the turkey hosts the party. You can transport it, but it’s a pain. Turkeys are best right out of the oven and it’s easier to make the gravy with fresh drippings. In case you were wondering, I haven’t brined a turkey since that year. It was a lot of extra work and it only tasted good. I find that fresh turkeys are worth the extra money. They taste better, absorb the subtle flavors you toss in the cavity nicely and have a lot less salt injected into them which keeps them from tasting too dry. If you’re serving your Thanksgiving feast at 4:00 and having an early breakfast, expect to have a few rumbling tummies. Having a quick appetizer to pass around will give your guests something to hold them over but won’t fill them up. It will also keep the pressure off of you while everyone waits for the turkey to finish roasting. Example: One Thanksgiving I made spinach artichoke roll-ups as a nice appetizer. However, they had to be baked and the oven was spoken for. Thankfully, there was a small convection oven on the countertop that I could use. The only problem was that it took longer to make everything because I had to work in batches. By the time everything was ready, half of the plate had cooled off. I learned my lesson after that and stick to a simple olive and pickle tray. They’re so easy to put together, don’t take up a lot of precious space in the fridge and are delicious. Any reason to have pickles works for me! Don’t wait until the last minute to put everything away, mop, and clean the bathrooms. The day of you should only have to vacuum and light a few candles in the bathrooms. It’s one less thing you have to worry about. Example: Holidays are stressful for me because that’s always the time of the year that everyone is hosting a party and work is chaotic. I get home and the last thing I want to do is make a pie. Instead of grumbling or skipping this homemade festival, I normally set aside a schedule. On Friday I’ll do my grocery shopping, Saturday I’ll make my pie, Sunday I’ll take off and Monday I’ll clean the bathrooms. I find that if I chip away at my To Do List it’s easier to face the holidays. The most satisfying moment every Thanksgiving and Christmas is driving home the night before the big day. The grocery stores are packed, cars are bumper to bumper and everyone around me is grouchy. Instead of feeding into it, I get to sit back and smile. All the hard work is already done and I can enjoy my holiday. 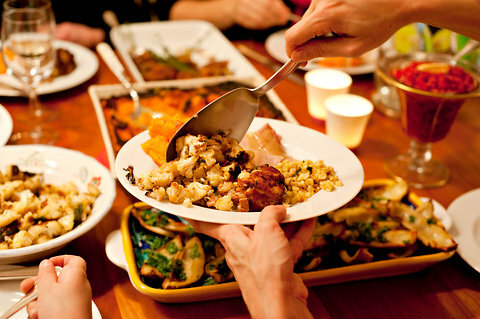 Holidays are the time of the year you get to spend with close friends and family and have a delicious feast. It’s a chance for old traditions and making some new ones. Whether you’re hosting your first Thanksgiving or bringing a dish for Christmas, there are some simple things you can do to enjoy the season instead of dreading it. Plan ahead, kick back and relax. Enjoy your holiday instead of feeding into the stress and frustration. The Christmas season is finally here! It’s the time for Christmas trees, beautiful lights, caroling, and presents. It’s also the time when weekends are booked, traffic gets backed up, the perfect gift is sold out and budgets become strained. Christmas is such a nostalgic time of the year and it’s also the most stressful. Why? Because we forget what the season is all about. My favorite quote I try to remember most during the season is: “But I am sure I have always thought of Christmas … as a good time; a kind, forgiving, charitable, pleasant time: the only time I know of, in the long calendar year, when men and women seem by one consent to open their shut-up hearts freely … And therefore, uncle, though it has never put a scrap of gold or silver in my pocket, I believe that it has done me good, and will do me good; and I say, ‘God bless it!’” Charles Dickens, A Christmas Carol. Christmas isn’t about the Black Friday sales or stuffing our faces with sweets. Christmas was meant to be that one time a year we step back and not only appreciate the many gifts that we have, but we share them with others. It’s so easy to forget that the gifts we have to share don’t have a price tag. This December I have decided to take part in a 12 Days of Kindness challenge. For 12 days, I get to stop worrying about my To Do Lists and think of someone else. Whether it’s writing a thank you note to the fire department, baking Christmas cookies to give away, helping someone carry their groceries to the car, volunteering at a soup kitchen, or picking up trash on the sidewalk, every action – big or small – makes a difference. I have gotten wrapped up in the chaos of Christmas too many times. This year, I want it to be different. Perhaps you feel the same way too. Would you be willing to join in? It’s simple. Here’s the website: 12 Days of Kindness. Anytime you take an extra moment to make a difference in someone’s life this Christmas season, tell us about it. We’ll share your story and help encourage others. You don’t have to wait until December. Make a difference today! Think of the impact we could have. 10 people across the nation or around the world could change a season bombarded with selfishness. We could remind people that the true spirit of Christmas doesn’t fit under the tree. It’s a simple action we take to make a difference in a stranger’s life.